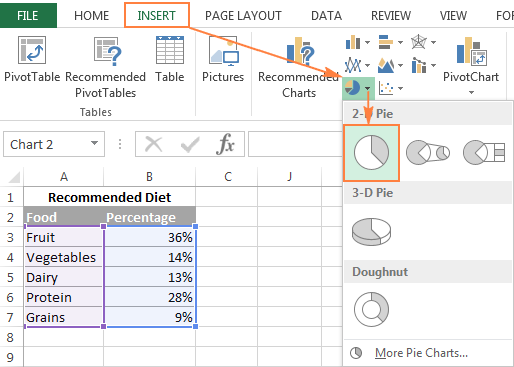 In this Excel pie chart tutorial, you will learn how to make a pie chart in Excel, add or remove the legend, label your pie graph, show percentages, explode or rotate a pie chart, and much more. Pie charts, or circular graphs as they are also known, are a popular way to show how much individual amounts or percentages contribute to the total. In such graphs, the entire pie represents 100% of the whole, while the pie slices represent portions of the whole. People love pie charts, while visualization expert hate them, and the main scientific reason for this is that a human eye is unable to compare angles accurately. But if we cannot stop making pie graphs, why don't we learn how to do this properly? A pie chart can be difficult to draw by hand, with tricky percentages presenting an extra challenge. However, in Microsoft Excel you can make a pie chart in a minute or two. And then, you may want to invest a few more minutes in chart customization to give your Excel pie graph an elaborate professional look. Creating a pie chart in Excel is extremely easy, and takes nothing more than a couple of button clicks. The key point is to properly arrange the source data in your worksheet and choose the most suitable pie chart type. 1. Prepare the source data for the pie chart. Unlike other graphs, Excel pie charts require organizing the source data in one column or one row. This is because only one data series can be plotted in a pie graph. You can also include a column or row with category names, which should be the first column or row in the selection. The category names will appear in the pie chart legend and/or data labels. Only one data series is plotted in the chart. All data values are greater than zero. There are no empty rows or columns. There are no more than 7 - 9 data categories, because too many pie slices can clutter your chart and make it difficult to understand. 2. Insert a pie chart in the current worksheet. As soon as you've arranged your source data properly, select it, go to the Insert tab and choose the chart type you want (we will elaborate of various pie chart types a bit later). Tip. Include the column or row headings in the selection if you want the heading of the value column / row to automatically appear in the title of your pie chart. 3. Choose the pie chart style (optional). 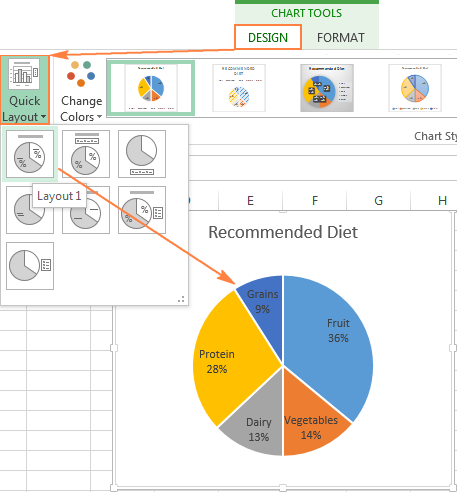 When the new pie chart is inserted in your worksheet, you may want to go to the Design tab > Charts group, and try different pie chart styles to choose the one that works best for your data. Agree, this pie graph looks a bit plain and certainly requires a few improvements such as adding the chart title, data labels, and maybe more attractive colors. We will talk about all these things a bit later, and now let's have a quick look at the pie graph types available in Excel. This is the standard and most popular Excel pie chart that you would probably use most often. 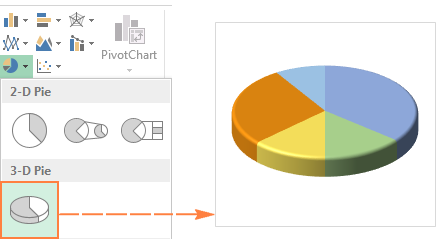 It is created by clicking the 2-D pie chart icon on the Insert tab > Charts group. A 3-D pie chart is similar to a 2-D pie, but it displays data on a third depth axis (perspective). 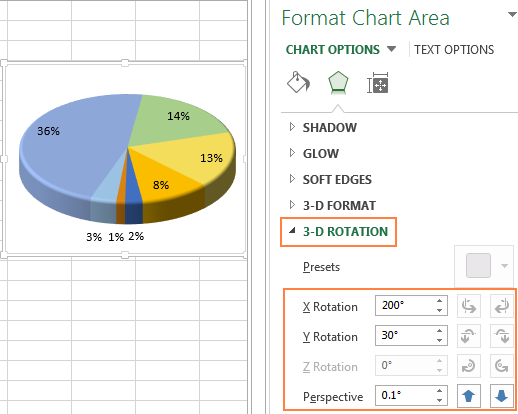 When making 3-D pie charts in Excel, you get access to extra features such as 3-D Rotation and Perspective. If your Excel pie graph has too many small slices, you may want to create a Pie of Pie chart and display small slices on an additional pie, which is a slice of the main pie. Bar of Pie chart is very similar to the Pie of Pie graph, except that the selected slices are displayed on a secondary bar chart. 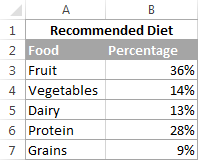 Choose which data categories to move to the second chart. Right-click any slice within your pie chart and select Format Data Series... from the context menu. Position - lets you select the number of categories to move to the second chart. Value - allows you to specify a threshold (minimum value) under which data categories are moved to the additional chart. Percentage value - it's like value, but here you specify the percentage threshold. Custom - lets you manually select any slice on the pie chart in your worksheet, and then specify whether to put it in the main or secondary chart. Change the gap between two charts. The number under Gap Width represents the gap width as a percentage of the secondary chart width. To change the gap, drag the slider or type the number directly in the percentage box. Change the size of the secondary chart. It is controlled by the number under the Second Plot Size box, which represents the size of the secondary chart as a percentage of the main chart size. Drag the slider to make the second chart bigger or smaller, or type the number you want in the percentage box. If you have more than one data series that relate to the whole, you can use a doughnut chart instead of a pie chart. However, in doughnut charts, it's hard to estimate proportions between elements in different series, and that is why it makes sense to use other chart types instead, such as a bar chart or column chart. Right click any data series in your doughnut graph, and selectthe Format Data Series option in the context menu. On the Format Data Series pane, go to the Series Options tab, and resize the hole either by moving the slider under Doughnut Hole Size or by entering an appropriate percentage directly in the box. If you create a pie chart in Excel only to have a quick look on certain trends in your data, the default chart might suffice. But if you need a beautiful graph for presentation or similar purposes, you may want to make some improvements and add a few finishing touches. Adding data labels make Excel pie graphs easier to understand. Without labels, it would be difficult to deduce the exact percentage of each slice. Depending on what you want to highlight on your pie chart, you can add labels to the entire data series or individual data points, as demonstrated in Adding data labels to an Excel chart. In this pie chart example, we are going to add labels to all data points. To do this, click the Chart Elements button in the upper-right corner of your pie graph, and select the Data Labels option. Tip. If you've chosen to put the labels inside slices, the default black text may be difficult to read on dark slices like the dark blue slice in the pie chart above. For better readability, you may change the labels font color to white (click on the labels, go to the Format tab > Text Fill). Alternatively, you can change the color of individual pie chart slices. If your Excel pie graph has more than three slices, you may want to label them directly rather than force your users to go back and forth between the legend and the pie to find out what each slice is about. For more options, click the Chart Elements button (green cross) at the upper-right corner of your pie chart, click the arrow next to Data Labels, and choose More options… from the context menu. This will open the Format Data Labels pane on the right side of your worksheet. Switch to the Label Options tab, and select the Category Name box. Under Label Contains, select the data to be displayed on the labels (Category Name and Value in this example). In the Separator drop-down list, select how to separate the data shown on the labels (New Line in this example). 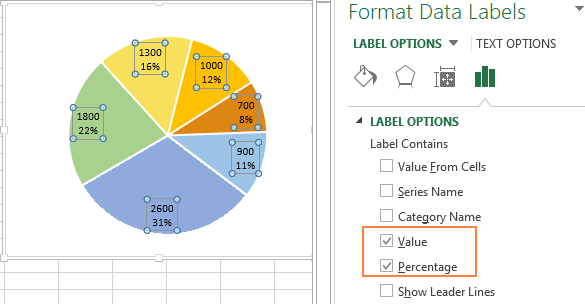 Under Label Position, choose where to put data labels (Outside End in this sample pie chart). Tip. Now that you've added the data labels to your Excel pie chart, the legend has become redundant and you can remove it by clicking the Chart Elements button and unchecking the Legend box. 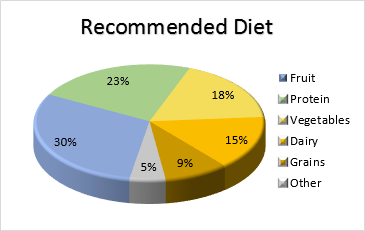 When the source data plotted in your pie chart is percentages, % will appear on the data labels automatically as soon as you turn on the Data Labels option under Chart Elements, or select the Value option on the Format Data Labels pane, as demonstrated in the pie chart example above. If your source data are numbers, then you can configure the data labels to display either original values or percentages, or both. Right click any slice on your chart, and select Format Data Labels… in the context menu. On the Format Data Labels pane, select either the Value or Percentage box, or both as in the following example. Percentages will be calculated by Excel automatically with the entire pie representing 100%. To emphasize individual values in your Excel pie chart, you can "explode" it, i.e. move all the slices away from the center of the pie. 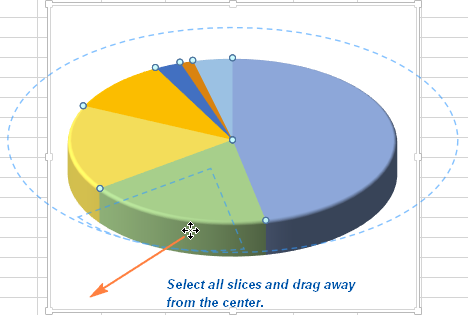 Or, you can add emphasis to individual slices by pulling them out from the rest of the pie graph. The quickest way to explode the entire pie chart in Excel is to click it so that all of the slices get selected, and then drag them away from the center of the chart using the mouse. 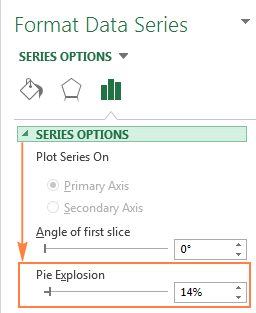 Right-click any slice within your Excel pie graph, and select Format Data Series from the context menu. To draw your users' attention to a certain slice of a pie, you can move it out from the rest of the pie chart. And again, the quickest way to pull out an individual slice is to select it and drag away from the center using the mouse. To select a single slice, click on it, and then click it again so that only this slice is selected. Note. If you want to pull out several slices, you will have to repeat the process for each slice individually, as shown in the screenshot above. It's not possible to pull out a group of slices within an Excel pie chart, you can explode out either the whole pie or one slice at a time. 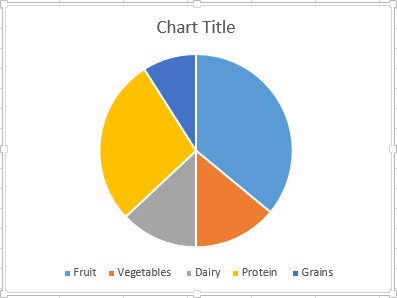 When creating a pie chart in Excel, the plot order of the data categories is determined by the data order on your worksheet. However, you can rotate your pie graph within the 360 degrees of the circle for different perspectives. Generally, Excel pie charts look better with the smaller slices at the front. Right-click any slice of your pie graph and click Format Data Series. 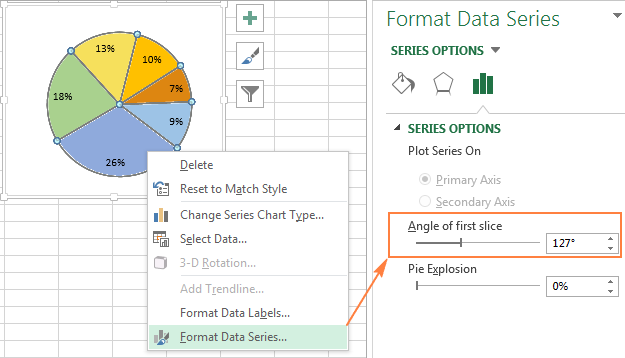 On the Format Data Point pane, under Series Options, drag the Angle of first slice slider away from zero to rotate the pie clockwise. Or, type the number you want directly in the box. 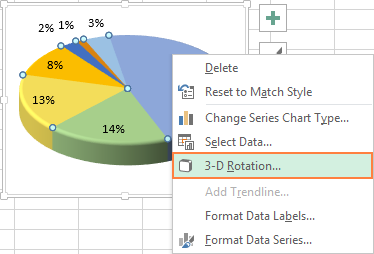 For 3-D pie charts in Excel, more rotation options are available. To access the 3-D rotation features, right click any slice and select 3-D Rotation... from the context menu. Note. Excel pie graphs can be rotated around the horizontal and vertical axes, but not around the depth axis (Z axis). Therefore, you cannot specify a degree of rotation in the Z Rotation box. 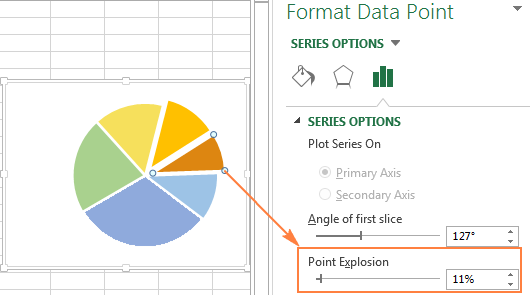 When you click the up and down arrows in the rotation boxes, your Excel pie chart will rotate immediately to reflect the changes. So you can keep clicking the arrows to shift the pie in small increments until it is in the right position. 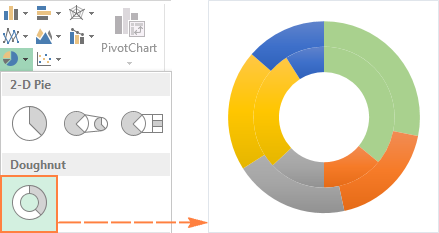 For more rotation features, please see the following tutorial: How to rotate charts in Excel. As a general rule, pie charts are easier to understand when slices are sorted from largest to smallest. The fastest way to do this is to sort the source data on the worksheet. 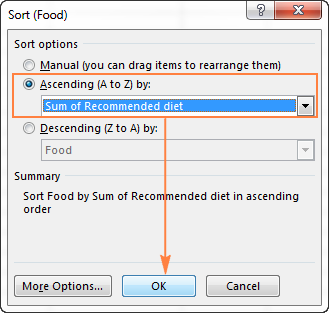 If sorting the source data is not the option, you can rearrange the slices in your Excel pie chart in the following way. Create a PivoteTable from your source table. The detailed steps are explained in the Excel Pivot Table tutorial for beginners. Make a pie chart from the PivoteTable and refresh it whenever necessary. 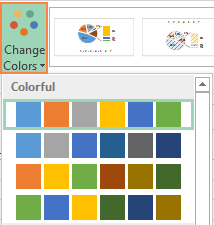 To choose another color theme for your Excel pie graph, click the Chart Styles button , go to the Color tab and select the color theme you want. 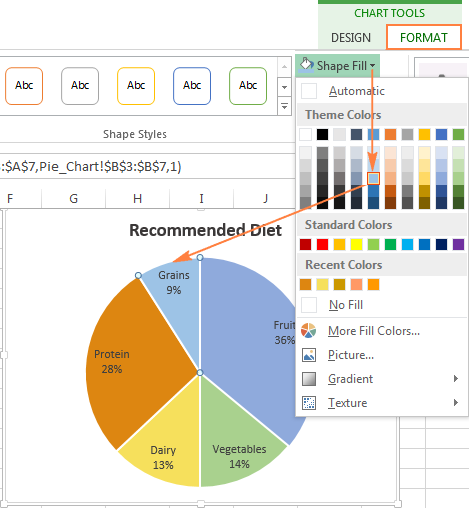 As you can see in the screenshot above, the choice of color themes for Excel charts is quite limited, and if you are aiming to make a stylish and attractive pie graph, you may want to choose each slice color individually. For example, if you've chosen to place data labels inside the slices, the black text may be difficult to read on dark colors. Tip. If your Excel pie chart has many small slices, you can "grey them out" by selecting grey colors for those small not relevant slices. When you build a pie chart in Excel for presentation or exporting to other applications, you may want to give it a polished eye-catching look. 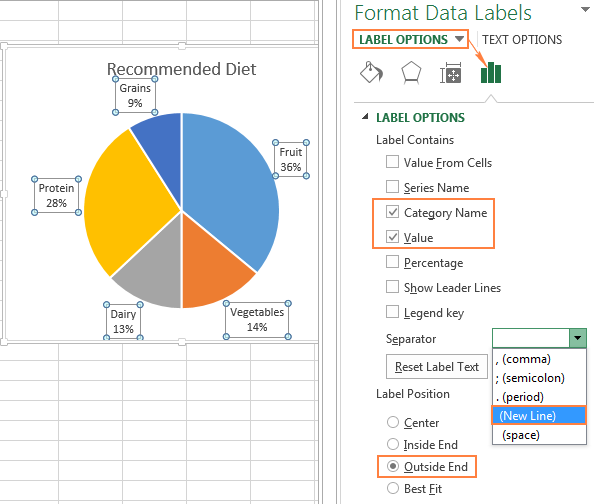 To access the formatting features, right-click any slice of your Excel pie chart and select Format Data Series from the context menu. The Format Data Series pane will appear on the right of your worksheet, you switch to the Effects tab (the second one) and play with different Shadow, Glow and Soft Edges options. To use these formatting features, select the element of your pie graph that you want to format (e.g. 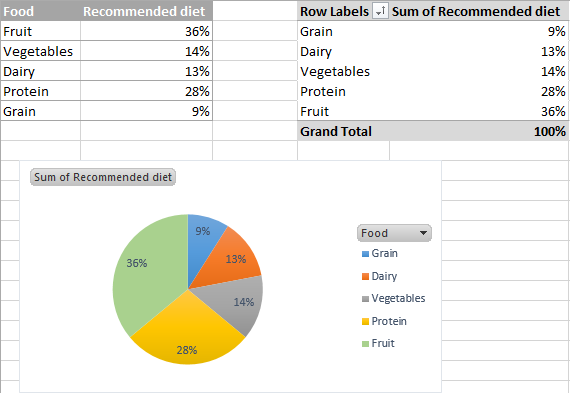 pie chart legend, data labels, slices or chart title) and switch to the Format tab on the ribbon. The relevant formatting features will get activated, and non-relevant ones will be greyed out. Now that you know how to do a pie chart in Excel, let's try to compile a list of most essential do's and don'ts to make your pie graphs both meaningful and good-looking. Sort the slices by size. To make the pie chart percentages easier to estimate, sort the slices from biggest to smallest, or vice versa. Group slices. If a pie chart contains many slices, group them into meaningful chunks, and then use a specific color for each group and a shade for each slice. Gray out small slices: If your pie graph has a lot of small slices (say, below 2%), grey them out or create the "Other category". Rotate a pie chart to bring smaller slices at the front. Don't include too many data categories. Too many slices can clutter your pie chart. If you plot more than 7 data categories, consider using a pie of pie or bar of pie chart, and move small categories to the secondary chart. Don't use a legend. Consider labeling the pie chart slices directly, so that your readers won't have to go back and forth between the legend and the pie. Don't use many 3-D effects. Avoid using too many 3-D effects in a single chart because they can significantly distort the message. This is how you make pie charts in Excel. In the next part of Excel charts tutorial, we will dwell on making bar charts. Thank you for reading and see you next week! 3 Responses to "How to create a Pie chart in Excel"
This is really helpful for us. Many thanks for this tutorial.It did help me achieve what i have been trying how to do on my own. An excellent tutorial, thank you so much.